Captain America has little reason to be successful, yes it does has fans, yes its source material is classic americana, but in comparison to the X-men, Spiderman, Batman and even Superman, he’s possibly the least interesting main-stream super hero. That’s why this movie is a victory, because by the end of the story, he’s so totally likable that even if you don’t like the plot, you love the hero of the story. The Cap’ has seen other incarnations, none more cheesy than the 1979 TV series, footage from which has been used heavily by Conan O’Brian over the past few months. But for being the classic all American hero, he’s seen little action over the past 20 years. As a result, I’m not terribly familiar with the mythos of Captain America. I grew up watching the X-Men, Spiderman and other superhero’s TV shows and I read several of their comics, but Captain america was never among those that I read. I remember one two-part episode of Spiderman that featured the avengers- which told a really quick origin story of the Cap, but other than that – I was not a fan of his until yesterday. I was delighted that director Joe Johnston finally got to direct a main-course film again. He made a splash with Honey I Shrunk the Kids in 1989. Then he made a superhero movie before it was cool- a period piece called the Rocketeer; this was a favorite of my family’s when it came out, and if you were to watch it today you would see why in many ways, Johston would be an obvious choice for a Captain America film. Most of the past 15 years he’s been relegated to desserts and side-dishes such as Hidalgo, Jumanji, Pagemaster and Jurassic Park III, all of which were underrated movies that failed to find audiences. He proved his ability to develop characters with perhaps his best known film, October Sky, which marked the beginning of Jake Gyllenhaal’s rise to fame. Having dabbled in the arenas of sci-fi, drama, horror, fantasy and adventure – Johnston was prepared to finally prove himself, by combining elements from all of these genres to make a truly great blockbuster superhero film. The story Centers around Steve Rogers played by Chris Evans. You may recognize him from the Fantastic 4 movies which I usually list in my top 10 worst marvel movies to-date. (but don’t worry they still rank higher than Hulk, Electra, Daredevil and The Punisher) He plays a much more likable character as Captain American than as the Human Torch, who is down right obnoxious at times. To be clear, Steve Rogers is Captain America, not the sound engineer by the same name who did most of his work during the 80′s. That’s a different guy, I didn’t want anyone getting confused. Steve Rogers is a loser, a little guy from Brooklyn – much like Peter Parker of the Spiderman Series. One of the ways in which the movie succeeds, is the development of Steve Roger’s character. Unlike Charles Xavior in X-Men: First Class, Rogers’ motivations for doing good are clear. Since he was small, he was bullied all his life. Though he didn’t start fights, he never ran from a fight. He says “If you start running, you’ll never stop.” Because the main course of the story takes place during WWII, Steve Desperately wants to go into the army, as he sees the Nazis as the ultimate bully and he wants to fight them even though at the start of the story he’s a 90 pound asthmatic. This also explains why his weapon of choice is a shield, he’s not out for blood, he’s out to protect the innocent. After being rejected five times by the Army, he’s met by Dr. Erskine (Stanley Tucci) who sees that Rogers is a good man. 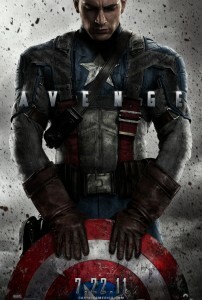 Erskine chooses Rogers for a special program to become the ‘first of new breed of super-soldier.’ Erskine likes Rogers because he’s a weak man and ‘the weak man knows the value of strength.’ The procedure works, but in the process the serum used to create Captain America is destroyed so that Steve is the only Super Solder. At first he’s sent around the US as a mascot, wearing the Captain America guise as a symbol to the people, though he doesn’t see any real action. He goes to the front to entertain the boys where he finds out an old friend of his has been captured and is in an enemy base just 30 miles away. Rogers, does exactly what you’d expect any superhero to do, he goes to the base and frees his friend where he meets Johann Schmidt (Hugo Weaving playing the role for which he was born) AKA the Red Skull head of a secret Nazi organization called “Hydra”. He discovers the Red Skull’s plan to annihilate several Cities the world over, including (bum-bum-buuum) New York! After Rogers’ success freeing the prisoners from the base as well as bringing back a great deal of intel on the Red Skull and his schemes, he’s given a team and is sent around Europe destroying more Hydra bases. The Shield is a surprisingly cool weapon throughout. In the meantime he befriends a very young Howard Stark, that’s the father of Tony Stark (Iron Man) and a beautiful young woman, Agent Peggy Carter. Penny is a british special agent who runs into battle with American soldiers and despite having no apparent protective wear other than her rather feminine uniform, is inexplicably unscathed despite the fact that almost every man around her gets killed – go figure. Howard Stark is played by a different actor than the one we see in Iron Man II, this put me off at first, but then I realized that this howard stark is at least 25 years younger than the one we see in that episode of the series and so it makes sense they he would look significantly different. One of the cooler things is that we see the Stark Expo as it was in the 50s, the same one that we see 60 years later in Iron Man II. It also shows us the full character of Howard Stark as both Walt Disney and Howard Hughes – we saw the Walt Disney characteristics in Iron Man II, in this episode we see the Howard Hughes end of his personality. What I Liked and Didn’t like. The movie does a good job of portraying WWII era new york, at least to a guy in his mid-20′s who only took one history class in college. The true victory in this area, is that it resists crossing that line between the fantastic and the absurd in regards to what was possible at that time. I enjoy things in the steampunk Genre, but in general the box office hasn’t been kind to them. Throughout the film remains just on this side of believable. Perhaps most impressive in staying true to the era is a car/foot chase early in the film which happens through the streets of New York. I don’t know where they shot those scenes, but it truly looks like a period film. The physical transformation of the Steve Rogers character is another victory, as Chris Evans’ entire body is replaced digitally for the first quarter of the film. If you didn’t know better you’d just think this guy was a scrawny looking kid with a big head, but when he comes out of the procedure, he, as my 6 y/o nice says “looks like a Ken doll.” This helps with what otherwise might be a terribly unbelievable plot. Since he went through such an enormous physical transformation, its easier to believe that he could do some of these amazing feats without any training. Aside from the physical transformation – the development of Steve Roger’s character is my favorite part of the movie. You see how much of a little weakling he is at the beginning and how much he has a heart to protect his friends. He’s not cool, he’s not smooth, he’s not good with women and to many he’s not the obvious choice to become a super soldier. Yet, he has a loyalty and sense of honor that is consistent with the old-fashioned hero. He’s straight up good-guy; they don’t try to make him an anti-hero at all. We also see that he’s a strategist, he thinks his battles through and tries to be aware of what’s going on around him. He’s not caught off guard and he never leaves a man behind. This is all a part of why he’s the logical leader of the Avangers, in a way that none of the others could be. He may not have the most interesting powers or the coolest weaponry, but he’s a leader and after the first five minutes, you’re rooting for him. My biggest problem with the story is that it feels like backstory. I don’t know if that’s just because I know that it is, but it doesn’t have the epic feel that a story of this scale could’ve. They skim over several action scenes by way of a montage and the final confrontation is not altogether satisfying. In one sense this movie is a middle sequel, between The Ironman Movies and The Avengers. Wait, this isn’t a sequel…is it? In case you don’t go to movies or read comic books and have no friends who do, let me explain what I mean by ‘middle sequel.’ Marvel comics has been producing a series of movies leading up to next summer’s release of The Avengers. The first of its kind, this new Avengers Film will use most of the same actors from five different movies featuring other superheroes from the team. At the end of the credits of each of these movies there has been a short scene teasing the tie-in to the new Avengers movie. The movie will feature Iron Man, Thor, Black Widow, The Hulk and Captain America as well as several villains from several of their respective movies. Captain America is actually the last one of these movies to be produced before next summer when the Avengers is released, so in that sense it is both a sequel to these other movies and a prequel to the Avengers. This movie is no different from the others in that it has a little something after the credits, but instead of a small scene we see the first trailer for next year’s Avengers movie. It looks wicked. For entertainment value I give this one 4/5 stars. It’s a great movie, but the climax is so leading to next summer’s avengers that it feels a little incomplete. For film value I give it 4/5 stars – the believability of it is good most of the time, but there are a few places where it could’ve been better. The acting was generally very good and dialogue not too awfully cheesy, but it isn’t Oscar material at all. For family friendliness, I give it a 3/5. It is definitely violent, but few main characters die in the course of the plot and those who do are not shown to be gory. The one exception to this it when the Cap throws a nameless badguy henchmen through a propeller blade in mid-air, the moment was so out of place that I turned to my brother-in-law next to me and said “that was a bit much.” There is almost no sexual material aside from a couple of kisses (one of which is possible at the least opportune moment of any movie I’ve ever seen.) And the language is on the milder side of pG-13. Overall I give it 4/5 stars and I encourage you to go see it, it will undoubtedly be one of the biggest movies of the summer and so far I have no problem saying that its in my top 3.